Allāh (الله) is the proper name of God, and humble submission to His Will, Divine Ordinances and Commandments is the pivot of the faith. He is unique (Wāḥid) and inherently one (ʾAḥad), all-merciful and omnipotent. The Qur'an (القرآن) represents the words of Allāh revealed to Prophet Muhammad, arabic محمد (Peace be upon him) through the archangel Gabriel (جبريل).The Holy Prophet's message transformed the society and moral order of life in the Arabian Peninsula through reorientation of society as regards to identity, world view, and the hierarchy of values. 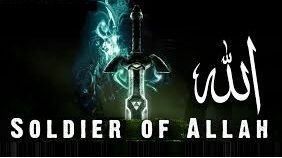 Al-Islam (الإسلام) is the monotheistic and Abrahamic way of life articulated by the Qur'an & by the teachings & the normative example (the Sunnah or سنة & Hadith or حديث‎) of Prophet Muhammad (صلی اللہ علیہ وسلم), the conclusive prophet of Allāh. A person with this belief is a Muslim (مسلم‎). Tableegh (Conveying the Divine message) is the first mission of the Prophet, which requires trustfulness, as the Prophet has to convey the Divine mission exactly as it is descended from Allah without any addition, diminution, or deviation, and as it should be according to the Divine order without any changing, alteration, or concealment. If the Divine message was descended texts from Allah (Quran) as words and meanings, then the messenger should covey it as is, hence, what we have in our hands (Quran) is conveyed by the Prophet PBUH, and it is exactly what was brought down by the trustworthy Ruh [Jibrael (Gabriel)]. It is the miraculous text, brought down by Jibrael (Gabriel) PBUH, on the heart of the Prophet PBUH, and with which we perform an act of worship by reciting it, and we come closer to Allah by comprehending and applying it. This is Qudsi Hadith that was descended on the Prophet PBUH’s heart as meanings only, and He should convey them, as is, in his own words. Though they are meanings, he should convey them without addition or diminution in those meanings. This Ayah is applied on all sincere proselytizers who convey Allah’s message. It comes down to one character which if it is existed in them, their mission will be on the right track, that is to fear Allah and no one else. Therefore, the first Mission of the Prophet is: To convey the Divine Shari’ah to people as it was descended, either in words or in meanings. The second mission is: For a profound wisdom that we might or might not comprehend, Allah the Almighty descended Quran as a comprehensive and inclusive Book, not to mention that the syntax of the Quranic text is polysemous, either in its interpretation, meanings, or indications. This nature of the Noble Quran is to honor mankind, as it opens a wide gate to mankind for Ijtihad (juristic deduction), Ta’weel (interpretation), Tafseer (exegesis), and Istinbat (deriviation), and all the deriviations between our hands by notable scholars, and jurisprudents (May Allah be pleased with them all), and all the Shari’ah that we have now are a result of the Quranic polysemous synatex. The Ayah puts an end to any Ijtihad, Tafseer, or Ta’weel. What if the Whole Quran was like this Ayah and that is it, it could be a 8700 pages’ book with all the details and there will be no need for scholars, interpreters, or jurisprudents, and there will be no need for derivation for Ahkam (Islamic laws), Thus, and there would be no test of your good opinion of Allah. He said: it means that He showed them what is to be wrong and deviated, just like a father who finds his son deviated or negligent so he shows him facts, and there is a big difference between saying that Allah the Almighty inspires the adulterer to commit adultery, and between saying that Allah showed the adulterer that he is a sinner and should repent. The Quranic Syntax leads to the several Istinbatat and ta’weelat and to the polysemous nature of it. This led to the need for scholars, and to have so many schools of thoughts, hence, the person who doesn’t have doubts in Allah is revealed, and the one who has no doubts is revealed thanks to the syntax of the Quranic text. Also, some of the Quranic Ayahs are not entirely clear, which means it should be interpreted in a way that suits Allah’s Perfection, and if it is badly interpreted, that indicates a lack of acquaintance with Allah the Almighty. So it was out of a profound wisdom that Allah descended Quran in polysemous syntax and gave mankind the mission to derivate laws from the Quranic Ayahs, and for that reason we have what is called the science of Fiqh Al Osool (Jurisprudence sources) which includes the foundation laws of Fiqh, and that led to the variety of schools of thoughts in Islam, and it led to have scholars of interpretation and Hadith, and the science of Jareh (invalidating narrators; rejecting the narrator transmission because he does not meet certain characteristics laid down by the scholars of Hadith) and Ta’deel (validating narrators), and other important sciences thanks to the nature of the miraculous Quranic syntax. One might ask: If only the Prophet PBUH had left us with a full interpretation of Quran, as that would save us the contradictions we have. The answer to that is: Who told you dear brother, that the Prophet PBUH didn’t leave an entire interpretation of Quran ?I It is the Sunnah and the Noble Hadith which is nothing but the Prophet’s comprehension to the Noble Quran. Hence, and for a profound wisdom, the Quranic texts are comprehensive and inclusive which need interpretation and clarification, and for that reason, one of the Prophet’s missions is to clarify to people the meanings of the descended texts (Quran Ayahs) and to show them their indications and senses. What is the meaning of the word “ warner”? Who or what is the warner? Scholars had different opinions with regard to this word, some said it is the Quran, others said it is the Prophet, while some considered the scholars after the Prophet are the warners, and another opinion is that the warner is reaching 40s of each one’s age. It is an Ayah that talks about Saum (fasting) in general, while the Prophet PBUH gave us the details of Saum, namely, he taught us about Sohoor (eating the last meal before the daybreak during Saum), about when to break the fasting (that is at sun set), and a lot of other things with regard to Saum and so forth. The third mission is: guiding the nation to the best of their well fair as He knows it, and warning them from the worst of their well fair as He knows it.The Prophet knows what the rest of us don’t know, sees what the rest of us don’t see, comprehends what the rest of us don’t comprehend, and feels what the rest of us don’t feel, all that because of His closeness to Allah, his approaching to Him, his lateral thinking, his right vision, and his deep comprehension. Hence, in addition to his first mission of conveying the message and his second mission of explaining it, there is the mission of guiding the nation to what we benefit from and staving it off what harms it. The Prophet left us what we can benefit from in our relations, like how to treat wives? How to treat our brothers? How to be fair to them? How to deal with people around us? How to sell? How to buy? And so forth. This is part of a long Hadith. Hence, the missions of the Prophet so far as we mentioned, to convey the message, explain it, guide the nation to the best of their well fair, and to warn them from what is harmful to them. The forth Mission: to rear people according to the Divine Shari’ah. There is Share’h (Islamic laws) and Manhaj (Islamic method), but what is the difference between the two. Hence, the Prophet PBUH conveyed the descended texts as they were revealed (the Noble Qur’an), the meanings that were revealed to his heart in his own words (the Noble Qudsi Hadith), He explained those texts to the nation, and He guided them to the best of their well fair, and warned them of the worst, He showed them the Divine method, and how man can be righteous, and how he can please Allah. You should be thankful if your house consists of three rooms, as there are houses consist of one room only, and you should be thankful when your health is good, as there are people with deadly diseases, hence, look to those who are lower than you are, lest you won’t despise any of Allah’s blessings on you. Whenever forbearance is added to something, it adorns it; and whenever it is withdrawn from something, it leaves it defective. I’ll explain to you this Hadith, if you have a son or a student it is much easier to hit him hard if he wronged, and out of fear this student will be disciplined in order to avoid punishment, and the teacher is rewarded for that, whereas if another teacher gives advice to that student, holds him accountable so many times till he admits his wrongdoing and avoids it, Allah will reward this teacher twice. There is a difference between Mudarat (favoring) and Mudahana (blandishment). Favoring: is to buy the Deen (religion) for the worldly life, such like favoring your neighbor, honoring him, and helping him till he loves you, and when he does so, you take him to the mosque, as he accepts that from you after you were good to him, after you served him, and after you were keen on his benefits. While blandishment: is to buy the worldly life for the Deen, such like leaving Salah to please someone who is against Allah, to speak out falseness against your beliefs, and to say something that contradicts your dogma, for pleasing this and that person. You are dealing with Allah who knows what is in your heart; did you use Deen to make a living? Did you exploit the Deen to get the worldly life? Did you soil the Deen for your lusts? Actually, If you want the worldly life then seek it from its sources, like trading or any other thing save Deen, as you should leave Deen pure, lofty, clean, and eminent, don’t exploit the Deen to the advantage of your worldly life. What does make the Prophet’s followers are more than one Billion at the time being? It is because He is a good example, as he was a good father, husband, friend, brother, guidance, leader, sympathetic, and passionate person. With a concise review, The Prophet’s missions are the following: first: conveying the Divine Shari’ah to people either as texts from Allah (Quran) or as meanings revealed to his heart and said in his words (Qudsi Hadith), second: explaining the meanings of those texts, third: guiding the nation to the best of their well fair and warn them from the worst, forth: rearing people according to the Divine Shari’ah. Part of the Divine Shari’ah Method is to proselytize people without aiming at any worldly purpose, be gentle in our call to Allah, not to compromise people on Deen account, being a good example, being a witness against the Ummah that he conveyed the message, fulfilled the trust, and gave them advice, and these are some of the Prophet’s missions PBUH. The Seerah has a number of unique features which make studying it a source of spiritual and intellectual pleasure. Studying it is essential for all scholars of Shari'ah, and Daa'iyahs who call people to Allah and those who are concerned with social reforms, to ensure that Islam will be conveyed to the people in a convincing manner, so that they will know that it is the refuge to which they should turn at times of trouble or confusion, so that the people's hearts will be open to the Daa'iyahs and the reforms promoted by the reformers will be more successful and more sound. We will sum up the most important and unique features of the Prophet (صلى الله عليه وسلم)'s biography. If you have any queries let us know.